I confess. I’ve been in a rut. An oatmeal rut. Mindlessly fixing the same bowl of oatmeal, day in and day out. Why? It’s easy, it’s convenient. I can make it in the crock-pot the night before while I’m wide awake and I can go on auto-pilot the next morning. It’s nice not to think when I get out of bed. I’m not a morning person and I don’t drink coffee in a vain attempt to make myself a morning person. It never worked, anyway. 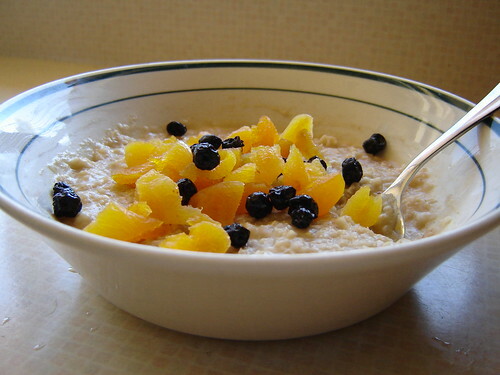 I’m perfectly content to eat a bowl of oatmeal for breakfast every morning, six days a week, for months on end. My kids are not. The complaints grew until one morning I looked up from my empty bowl to see their little upturned noses over their untouched servings. Que the revolt. The natives were restless and I’d better do something. So the next day I got in the kitchen and cooked up this kid-pleasing breakfast and issued a promise that I wouldn’t serve oatmeal more than three mornings a week. The chief cook and bottle washer is safe. For now. If your kids don’t like bananas, you can use another fruit. I couldn’t cook these fast enough, my kids ate them and got back in line at the stove while I cooked. They’re requested it to become a weekly feature on our breakfast or snack menu. If you don’t want your child eating two bananas in a day, do one rolled up with the banana and any additional crêpes rolled up with the nut butter, omitting the banana. In a blender, combine yogurt, water and flour. Blend until smooth. Cover and allow to soak for 8 hours or overnight. The next morning, add the eggs, rapadura, stevia, 1 Tbs melted oil, salt and cinnamon to the blender and blend until smooth. Set aside. Heat a skillet over medium heat. Spread a thin layer of oil over the bottom of the pan using a pastry brush. Pour 2-3 Tbs of the crêpe batter into the hot pan and spread it into a 4-inch circle. Cook about 2 minutes on one side. Using a spatula, loosen all of the edges then gently flip and cook another 1 minute on the second side. Repeat until the batter is used up, keeping the pan lightly oiled with the pastry brush between crepes. Spread each crêpe with a thin layer of nut butter and place a banana on top. Roll the crêpe around the banana like a taco shell. This is one of my go-to meals when I am in a great hurry time-wise when I had planned to cook dinner. You know those evenings, where you have some meat thawed and a meal planned, but something comes up that needs your attention instead? I use it when I have time for the oven to do all of the work but I don’t have the time to stand there. The chicken takes me about 10 minutes to get it in the oven. If I don’t have any leftover rice in the fridge, have one of the kids scrub some potatoes, poke them with a fork, rub with oil and salt them. I place them in a baking dish and put them in the oven when I begin pre-heating it, before I put in the chicken. Check them when the chicken is done, as they might need a few extra minutes. Then I pull out some leftover veggies or 10 minutes before the chicken comes out of the oven, I saute up some pre-prepared kale and I have a quick meal on the table in less than 20 minutes of hands-on time. Prepare your greens when you get home from the store. Wash them, cut them, dry them thoroughly and roll it all up in some paper towels, sealing it in a ziplock bag. You have a quick side dish whenever you need it.